Please note that the content of this book primarily consists of articles available from Wikipedia or other free sources online. 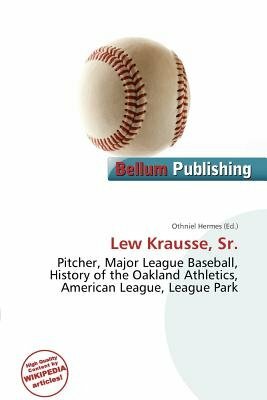 Lewis Bernard Krausse (June 12, 1912 - September 6, 1988) was an American pitcher and scout in Major League Baseball from Media, Pennsylvania. He pitched from 1931 through 1932, only for the Philadelphia Athletics. When he was called up to the Athletics in 1931, he was the American League's youngest player. Krausse was used mostly as a relief pitcher by the Athletics; only four of his 23 appearances were starts. He compiled a lifetime record of 5-1. Krausse's most memorable start was on July 10, 1932, at Cleveland's League Park.